Mike Alvarado did the tough job that was needed to come away with a decision, but he took a terrible beating along the way at the MGM Grand, Las Vegas. His decision win was a tribute to his courage and ability to keep on keeping on, avoiding the many kayo shots coming his way, which allowed him to come away with a decision. But, if there’s a third fight, don’t bet on him being able to do it again. The physical appearance of the winner and loser during the post fight interview chaos made one wonder how Alvarado pulled it off. His face was a bloody pulp, and Rios was still bouncing around like the Energizer Bunny. Rios definitely took plenty of hard shots too, but the damage was much less evident on his kisser or his post fight demeanor. It’s doubtful whether Rios was being totally truthful when telling HBO announcer Max Kellerman he hadn’t been rocked by his conqueror, but it was also true he wasn’t shook enough to lessen the “dangerous when wet” sign that should have be pinned on his back. Once Rios works up a sweat, watch out! Even as the end approached, viewers knew he could still end it at any time. His shots were still full of power, and whistling on straight, short pathways. Unfortunately for him, they were just barely missing, and Alvarado was bouncing side to side enough to keep Rios from throwing the combinations he really desired. That was the big difference in the fight. Alvarado moved often enough to keep Rios from unleashing his full attack. On the other hand, with the exception of several big right hands, Rios rolled with many of Alvarado’s punches, lessening their effect, but he was losing the numbers game. Alvarado landed slightly more, just enough for him to maintain an edge in the number of rounds won. However, he was paying a hell of a price. By the end of round twelve, his face was a swollen, cut up mess. Undoubtedly his insides felt like his face looked. If you had your druthers about which man you preferred to be, simply based on physical damage, Rios would have been your choice. As previously mentioned, Alvarado employed enough lateral movement, coupled with some beautiful right hands, to keep Rios off stride. 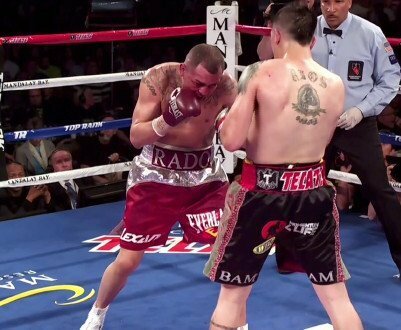 Just when Rios seemed ready to amp things up a bit, Alvarado would muster up enough courage to beat him to it. Even so, many of his punches bounced off Rios’ guard, or he deftly rolled with them. There were still though that got through to strifle Rios’ attack and score points. One compliment directed toward Alvarado in this second fight was his determination to move more (laterally) than in their first war, and to avoid leaning down and into Rios short, powerful inside punches. Of course, he wasn’t able to do that all of the time. On plenty of occasions, Rios cut the ring off. During those times, Alvarado held his own and managed to escape the knockout type shots. but he was absorbing a lot of punishment. If they fight a third time, don’t count on repeat performance. Alvarado is not fast enough on his feet; nor is his balance good enough for him to be successful a second time. Rios will view the films and realize he let slip by many opportunities to close the show. The truth is Alvardo doesn’t have the foot speed or balance to keep Rios off of him. Next time around, Rios will ignore some of the annoying and disruptive things Mike turned into effective strategy. Rios will knock himself upside of the head when he realizes how often Alvarado was off balance and out of position, and therefor incapable of putting over a really telling blow. As a result of that realization, next time he will blast through more, knowing he is the one in proper position, and the one who truly can inflect the kayo damage. Robert Garcia will certainly help him come to that realization, and next time around, regardless of how much courage Mike displays, expect to see what many thought would happen Saturday at the MGM, and that was a Rios knockout.